From time to time our genetics colleagues propose projects that perhaps belong more to Hollywood or the video industry. At least that way no inadvertent harm could be done. But, hell, a big ego splash or some book royalties might make one a bit reckless. I refer here to ideas about cloning extinct animal species from DNA rescued from preserved bone or tissues. Some recent species, like Dodos, might be directly clonable in some way, and in some senses could have some value--assuming that making one or a few of them is good for someone--themselves, that is, not just zoo-goers. However, how do you do this? The best idea would be to take an entire cell, re-set its DNA/RNA status to that of a fertilized egg, and let 'er rip. But how? Unless you can make that cell develop all by itself in a Petri dish, the answer isn't obvious. The usual idea, at least for mammals, is to find a surrogate mother. Generally the approach has been, for mammals at least, to extract a complete nuclear genome from a fossil specimen, take a surrogate mother's egg cell (from its ovary), remove its nuclear DNA, replace it with the fossil's DNA, and inject it into a hormonally prepared mother for gestation. This is basically the 'Dolly' approach and to my (clearly incomplete) knowledge it is still the basic idea. But there are problems with this, if you really want to revive a species as opposed just to getting a farm-worthy sheep or the like. One problem is that you need the host-species' egg, and that means its mitochondrial DNA (mtDNA, which is not in the nucleus) and the RNA and other contents of the host egg cell. Even if you can use an entire intact nuclear genome, the resulting new individual is necessarily a hybrid between its mother and the other exogenous DNA. For agriculture, there are some well-known problems such as the fact that the host's cell will reflect some aspects of the host, like mutations in mtDNA or the RNA from its nucleus, and so on. The new individual is in some senses already a bit old, for example. These problems can probably be dealt with, or perhaps have already been. But with extinct species there are other problems. Among them is that the DNA is usually not entirely intact in any cell. From fossils or extinct species, it may be degraded into very small fragments. By sequencing currently living relative species, we can identify roughly what part of the genome those fragments come from, and if we have several samples we could perhaps find in some sample each necessary fragments. That's still not the same as having intact chromosomes, and almost certainly some large subset will be missing. Then, however, you have to find the surrogate mother, and if the species is extinct you have to use a current, similar species to do this. Mammoths and Neanderthals . . . .
Let's for the moment ignore the fact that the cloned individual in these cases really won't be a cloned individual of its original species, but some kind of hybrid or chimera. Suppose the attempt were made. What then? Two of the favorite species that the raw, I'd say cruel Frankenstein egotism and its simplistic portrayal of the idea to the public, are Neanderthals and mammoths. Maybe the suggestions have only been publicity stunts, given the real issues in the world that serious geneticists could address, but they seem to have been offered seriously, and they show to me how science needs to be kept under control. Neanderthals and mammoths are social beings. Real ones were gestated in mothers of their own kind, eating their natural diet, in their natural social (and hence hormonal, physiological) circumstances, and born to families and nurturing, educating, protecting, natural social groups. Once born, they were incorporated into the group in a way that they presumably evolved to be. How should a cloned Neanderthal be treated? It would be basically human: recall that we all carry some Neanderthal inheritance through extensive inter-mating way back then. Would it have civil rights, such as to education, a home, voting? Could one experiment on it, to test aspects of its physiology? Could it be put on display in a zoo or some university museum? What about mere mammoths? One leading Mary Shelly imitator has suggested that cloned mammoths could be plunked back into 'natural' conditions in the Arctic, where there aren't (currently) too many humans around to destroy their environment--assuming, in a fantasy way, that commercial tour groups would not be immediately organized, to go gawk at them (including by 'scientists' who want then to publish papers in Nature on their behavior), and that they wouldn't be kept in zoos or labs in our august universities. Such innocent-sounding ideas as cloning these extinct beings are far more egotism and ignorance--or willful avoidance of realities--than any sort of sound proposal. Like humans, mammoths are social beings. The Arctic today would not be a hospitable or normal place for a mammoth. A surrogate elephant mother would not gestate a normal mammoth, in ways large or small that we can't really anticipate or even know. It would be plunked down by itself or in a pack of clones that didn't have normal social life to be raised in. Even if it had a mother who loved it rather than rejecting it as a freak, it would not be a mammoth mother, nor would its life replicate the mammoth's natural existence as a herd species. It is cruelty to suggest otherwise. In memoriam, or a lesson never learned? 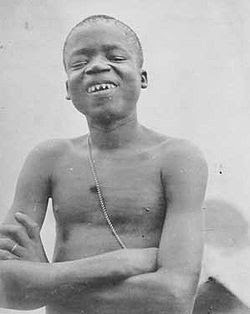 Let's not forget one Ota Benga, an African man, obtained from a slave trader, and exhibited at the St Louis World Fair in 1904 and then put on display--is there a better way to state this?--in the Bronx zoo! Nor let us forget poor Saartjie Baartman, a southern African native, put on display, naked, around Europe to exhibit her exaggerated private parts, in early 19th century Europe Traveling freak shows, might one say? It is to be noted that the people involved were leaders of their time, and people responsible for such dehumanizing practices have included prominent scientists at major universities. Anthropologist Franz Boas requested that explorer Robert Peary bring an Inuk back from the Arctic, to be studied by scientists at Columbia. In our age of science, the idea of cloning extinct species seems exciting and appealing on the surface, a kindly sort of rescue--until you think about it carefully. As you can tell, I feel quite strongly about this. It's playing games with other sentient organisms' lives for no seriously justifiable purpose. If it's hard enough to justify or excuse what we allow to be done with mice and other species for research purposes (and I include myself among the accused), this is beyond beyond. To me, personally, these juicy cloning suggestions reflect the cold, selfish, arrogance of science, and scientists in leading universities. The poor target species have nobody to defend them, and that is why these proposals, irresponsibly presented in the media, can get off the ground. One sees little censure of these ghoulish proposals, whose presumptive nature is essentially a continuation of the eugenics movement. The video industry is as close as we need to get to these notions. Let us not forget our history. We recently returned from a 2-week trip to Italy. Two of our children and their spouses live in Europe. One couple lives in a small town in northern Italy, the other in central Switzerland. The latter drove down to Italy where we all enjoyed seeing each other, which is not easy given the distances. But while this vacation/family gathering was very pleasant and, to us, important, it raises some less pleasant thoughts about sustainability in our time in history. My concerns are personal, but in a sense also global, and to some extent they relate to societal inequity: not everybody can just drop a few thou and travel across the ocean for a couple of weeks' dinners with family. But beyond unfairness, my concerns are about other issues. This was a very energy-bad vacation, and we weren't alone! 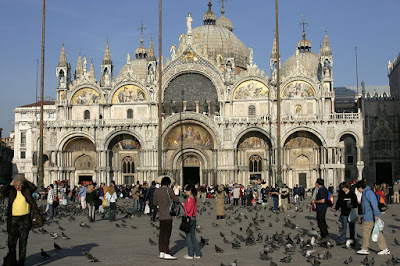 We flew from the east coast to Venice, the most convenient airport for our purposes. We flew on a large plane, maybe 2/3 full of passengers. As we all know, one of the worst ways to contribute to global warming is to fly. The aircraft was largely filled with people taking cruises in the Mediterranean. The trip was about 3700 miles each way, not including the various train and car junkets we took during those two weeks. And then there's Venice itself. We stayed a couple of days there to recover from jet lag, and to see the sites. We'd been there for a science meeting once before. Bella Venezia! Once home to a world-leading trade empire, and to many great cultural and architectural wonders and of course its romantic lacework of canals. The glory days were then, but what is the city today? Venice takes in something like 100,000 tourists a day, well more than the number of people who actually live there. The piazzas, side streets, walkways, and bridges--and they are very scenic indeed--are often a shoulder-to-shoulder river of tourists. They (and we) sightsee in museums, shop, eat, shop, stay in hotels, eat, and shop. It is obvious that a huge amount of money pours into the city, every day, all year, and has been doing so for decades if not centuries. Even forgetting their thought-provoking historical value and more trivial entertainment value, and just thinking of them as Disneyesque curiosities for selfie-ops, these museums, shops, and hotels are staffed by an army of people who earn their living from the tourist trade. So while Venice is in a sense unique and beautiful, it is also in a perhaps deeper sense something of a fake, a touristic Potemkin village, a hyper, full-time, full-scale Disneyland entertainment park, there today mainly to pluck the pockets of the relatively idle affluent and wasteful denizens of our planet (I certainly include myself in that category!). 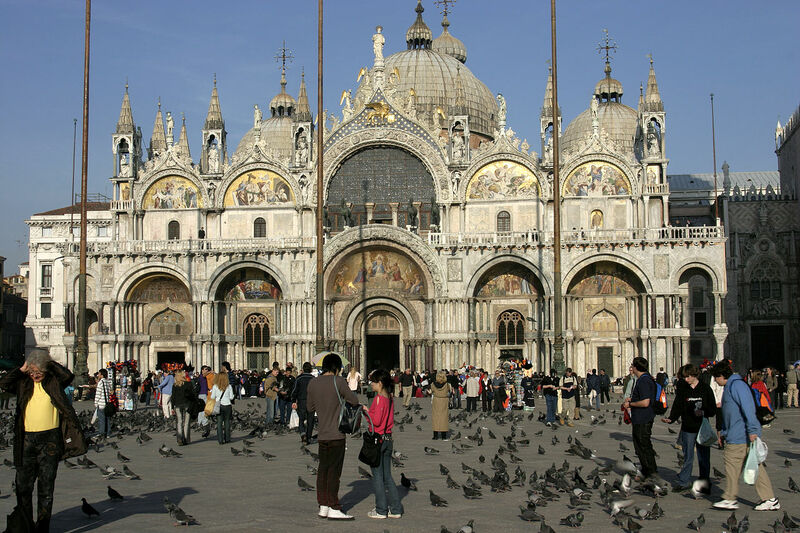 Venice is but one rather small city on the global tourist map. If you think about the amount of fuel used to transport everyone to, from, and around Venice (and even take into account that the gondolas don't require fossil fuel! ), and then multiply that by the hundreds of tourist sites around the world, you have to wonder what hope there is for containing global warming. There is no sign of self-restraint of any kind here--even on departure to return home, the airport luxury shops do a booming business as tourists part with whatever dollars they've not yet spent. But what can one seriously do? It is easy to chastise people who take such totally needless trips, even if accompanied by a self-incorporating mea culpa. After all, this really is a nearly total luxury. For most of human history those relatives who moved or sailed far away never saw their family again and corresponded by mail (if at all, if there was such a thing as 'mail'). That was just how life was! Our family get-togethers are a new, pure luxury. In a seriously conservation-dedicated world, we could dispense at least with the purely sightseeing, self-indulging kinds of global vacationing. That would seem like something trivial, a luxury that a resource-conscious world could easily forego. But even if we all were so equitable, fair, future-aware, and so on, things aren't nearly so simple. The world is crowded with people and much of it is industrialized, with the number of people who live on the land, as subsistence farmers, declining every year. We have hugely diverse economies, in a sense creating occupations that earn money so we can swap that for food and so on. Most of it isn't really necessary. Among these non-food related activities is tourism, which is huge because so many people are now wealthy and idle enough to take global junkets. In turn that means that much of the world depends on travel and sightseeing. Countless peoples' livelihoods are involved. This is in a sense quite antithetical to global sustainability. If we seriously slowed down travel to save fossil fuels and reduce warming, then tourism, air travel, cruise ships, and the people involved in the manufacture and operation of planes, ships, trains and buses, their ports and terminals, would lose their jobs. The manufacturers of tourist-related goods, including Venetian carnival masks, post-cards, luxury shopping goods, hotel supplies, restaurant foods, chefs, waiters, menu printers, clerks, etc. would be hit. Venice, already a shell of its former self, would cease to have a reason to exist. Even those who deliver all these goods during the night, and those who remove the trash, invisible to the tourists sleeping quietly in their beds, would be affected. Society would somehow have to do something about their employment needs. This means that the idea of just paring back on consumption really is a dream--or, as every even mild economic depression shows, a nightmare. And just the one example of tourism, essentially a luxury trade, involves countless thousands of people. Needless to say, all of this is grossly unfair to the huge majority of people living on or below the margins. It shows the inadvertent implications, even the distanced cruelty, of those idealists who want quick changes in sustainability directions. If we say 'we must rush' then too many will find rationales for not going along ('OK, it's a good idea, but I can't do it--I have to see my family overseas!'). So where is a feasible ground to be found, and to what extent should we personally expect to be affected by it? What will we give up for the cause? The question, for me, is not abstractly how much one must cut out of what one does, but how much I must cut! That gets pretty close to home, so to speak. I can't help but add a rather gratuitous, if snide, side comment. The problems are compounded in an ironic way. We have agricultural sustainability issues, as everyone by now should know. The 'developed' world suffers common diseases largely due to bad nutrition and that means to over-eating. So while much of the world barely scrapes by, many in the rich world waddle along largely over-weight (these are not the minority of people struggling with genetic or epigenetic problems that make weight control a real challenge). The obesity epidemic is why we hear complaints about airplane seats being too small! So I remark snarkily that, as a consequence, one reason air travel is so environmentally unfriendly is the countless tons of human bulk that are being transported daily across the oceans in tourist-filled aircraft. One thing leads to another. We just took what was clearly a very energy-bad trip, no matter how understandable our desire to be with family and our decision to go. We could, of course, have talked with our family members via Skype--indeed, we already do that often. I complain that leaders in sustainability and climate change, including the very organization that documents it for the UN, fly all over the world and meet in fancy hotels to discuss the problem and tell everyone what they (that is, they) must do to 'save the planet'. The leading spokespersons for sustainability and climate-change avoidance could set a very public example and work only via Skype! In the context of global conservation, sustainability, and climate issues, who should feel guilty about what? If do as I say not as I do is not acceptable, then what justifies our personal exceptionalism? For me, the answers are far from clear.